← What? No Royale with Cheese? Picture it. It’s 11 a.m. The coffee is wearing off. It’s too early for lunch but you want a little something. What to do? Well, meet one of Britain’s most perfect solutions: Elevenses (pronounced: Eleven-zees)! Ah, tea and biscuits! A sight for sore eyes! I'm not sure what kind of biscuits these are. Lemon poppyseed, perhaps? Elevenses is a traditional little mid-morning snack, complete with tea and often something sweet like a biscuit (translation: cookie), iced bun or slice of cake. Just a little something to get you over the hump until lunchtime. It’s a little respite that the Brits take seriously. Apparently, Winnie the Pooh enjoyed some honey on bread and condensed milk for elevenses and Hobbits eat elevenses to break up the time between their second breakfast and lunch. What is your favorite thing to eat for elevenses? 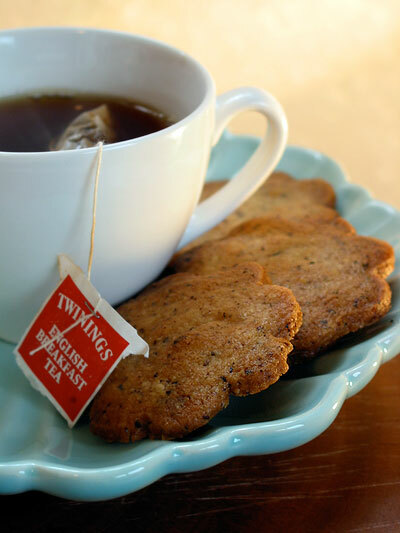 Posted on 13, September 2011, in Food and tagged British, elevenses, food, morning, snack, tea. Bookmark the permalink. 5 Comments. I love Nutella too – and thankfully it’s something that is very easy to find in American supermarkets! Down under it’s morning tea…. sometimes smoko. And it is definitely the smoko room. Strange, especially now that it’s smokefree in workplaces and indoors! Normally savouries (pies, sausage rolls) or muffins. Clotted cream and scones was a special British morning tea.